I saw this wonderful article on Purple Clover and thought ‘I could put my own spin on those resolutions, I’m a woman in the midst of a midlife crisis’. Perhaps that’s why I connected so easily with what Sharon Greenthal had to say. Granted I had those thoughts back in December last year when the article was written and it’s taken me this long to get around to creating my own version. But as today marks the day I’m another year older, another step away from that half-century milestone, I thought this day was the perfect day to think (and write) about what I’d like to do, or change, about myself over the coming year – or years. I will not give up trying to lose weight. I know inside me, there is a trim, taut and terrific version of myself screaming (or is that starving) to get out and I will continue to believe that one day she will emerge like the beautiful butterfly she is. I will keep trying and won’t give up. I promise I won’t give up. I will walk at least 10,000 steps a day. I will stop buying clothes one size smaller than I need. I buy them because my mind says: “That dress is a good price and you’ll be able to wear it when you lose a little weight!” But inevitably, my weight remains the same and that bargain buy ends up being donated to charity. (Perhaps not the worst outcome.) But I’ll try to stop. And I will keep buying my real clothes from the ‘Big Girls’ shop because when I do, they fit, I look and feel glamorous, and I should be happy whatever my weight is. I will stop buying notebooks and journals to write down my thoughts. I promise I will keep writing things down. I will stop trying to change my husband. I will stop being annoyed by his habits that drive me crazy and accept him with all his little idiosyncrasies. I’m sure they are what attracted me to him in the first place, and are a huge part of the person I love and share my heart with. I will remember that aging is a gift not afforded to everyone. I am now older than my mother was when she died and even though she left us more than 22 years ago, I still miss her every day. I know being the age I am is a precious gift and I treasure every day. I promise I will not forget. I will be grateful for the signs of aging. There’s a line in a Garth Brooks song that goes: “It’s four in the morning, I’m lyin’ in bed – A tape of my failures, Playin’ inside my head”. I hear these words inside my head most mornings when I wake before the Sun does. I will stop stressing about the past because what’s done is done and I can’t change it now. I will stop feeling guilty about the decisions I made as a parent. I did the best I could and our daughters all turned out (better than) ok despite pizza for dinner every Friday night and fried potato overloads (potato chip, potato gems and potato scallops) from the local fish and chip shop most Sunday afternoons – despite being late for school most days because I couldn’t get out of bed – despite the wooden spoon. Yes, despite all the bad decision I believe I made, our daughters all turned out (better than) ok. I will no longer ask my daughters if they are thinking about making me a grandmother any time soon. I’ve finally resigned myself to the fact that by the time they do (and yes I still hang onto that hope), I will not be the cool, hip, trendy grandma I envisaged I would be years ago. I will be old and grey, almost incapable mentally, but certainly incapable physically of keeping up with grandchildren who will, without a doubt, call me ‘Grumpy’. I promise I won’t do this anymore. Today also marks my ten year anniversary of breathing easy. It’s hard to believe I gave up smoking ten years ago, but I did. It took a lot of hard work and a nudge from Dean, but I did it. You can read more about this decision and journey here: Exorcising my Demon where I spoke about how good it will feel to reach the ten-year milestone. 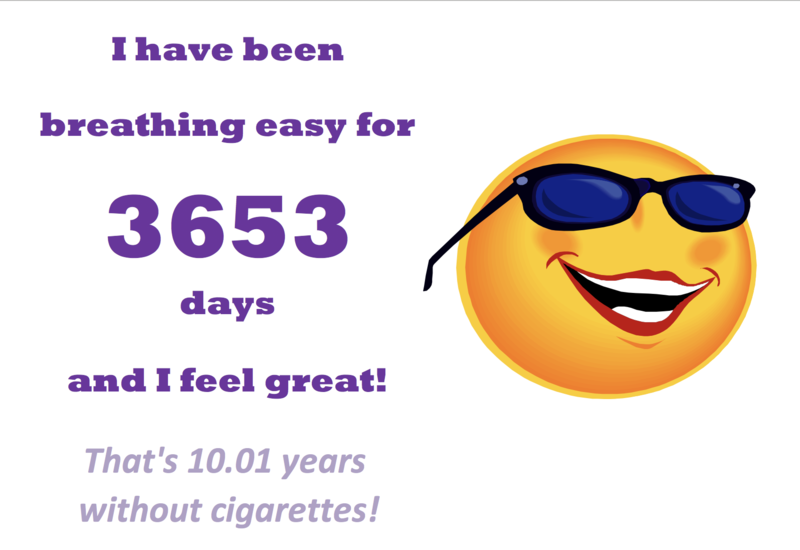 I opened my Days Smoke Free Excel file this morning to see that magic number – 3653 – ten years and one day. This day, today, is finally here and it feels wonderful. Today marks the day I’ve been breathing easy for longer than I’d fought to exorcise my demon and I do feel chuffed about that! Not quite in response to the Sandbox Writing Challenge – What are you holding onto from the past? Previous Post Previous post:Not Happy, Jan! Found you by way of The Sandbox Writing Challenge on Cheryl’s site. Really related to so much of what you wrote. Congrats on 10 years quit — just celebrated 13 in January myself. =) Happy Birthday too. Nice to meet you. ♥. Thank you. Yes you will. That keeps happening doesn’t it? A very good thing! ^_^ ♥. Thank you Calen 🙂 – yes we’ve both got that covered. Happy Birthday! And congratulations on 10 years without smoking! By the way …I’m older then YOU! Thank Nancy – it feels so good 🙂 very good.